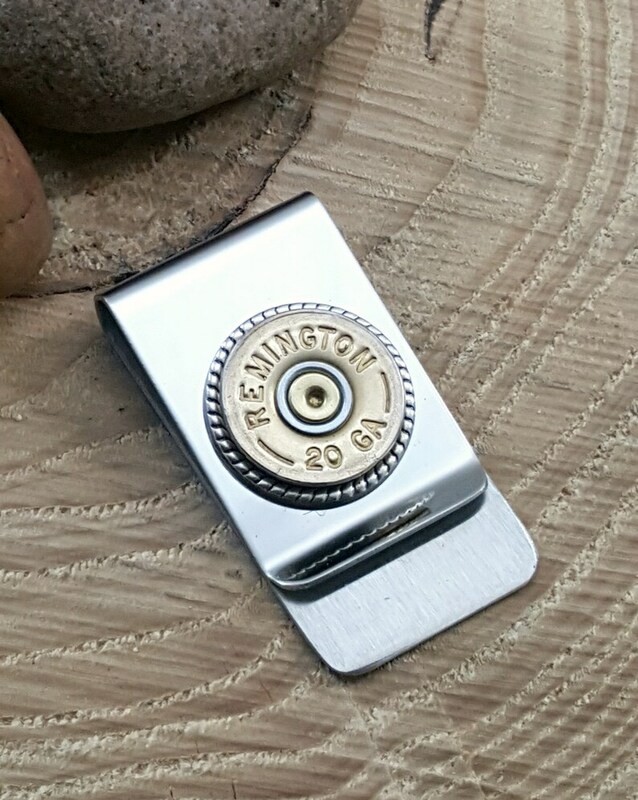 One of our most popular sellers from the SureShot™ collection, this money clip features a 20 gauge shotgun casing for a gift that really packs a punch for any man! Using our patented process, we've prepared the casing, mounted it in our signature smooth or rope edge bezel (to give the casing a little dimension and style!) 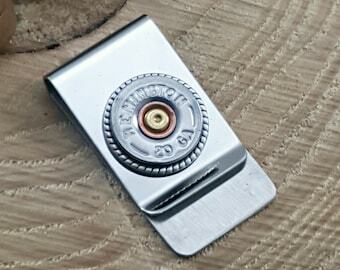 and secured it a sturdy and shiny stainless steel money clip. We never flat mount any of our components, but set them in a variety of our signature bezels for high quality, expertly crafted accessories. 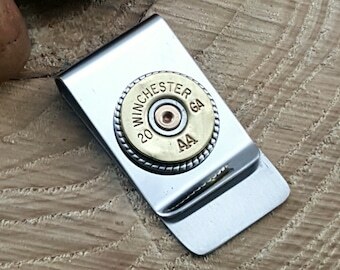 CHOICE OF 3 STYLES - Brass Winchester, Brass Remington or Silver Remington. Use dropdown to make your selection or check "you choose" and we will pick one from our current inventory. Have a wedding coming up? 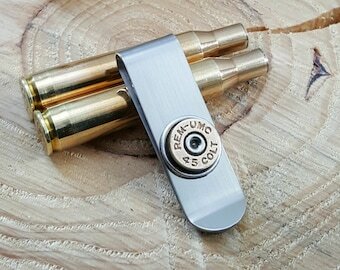 These money clips will be the perfect gift idea. Also shop our men's items for cuff links, tuxedo buttons, tie tacks/lapel pins and key chains from our exclusive SureShot™ collection. See other listings for more styles. 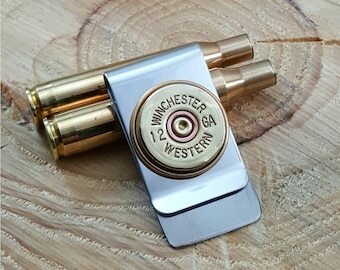 We carry 12 gauge shotshell money clips as well as rifle and revolver casing money clips too. *Want a slim style money clip? We have them. See other listings. Here is a link to our Etsy shop’s home page: www.thekeyofa.etsy.com. SureShot™ is a trademark of The Key of A, LLC. ©2016. The Key of A, LLC d/b/a SureShot™ Jewelry. All Rights Reserved. Titles, Tags and Descriptions are part of The Key of A, LLC’s intellectual copyright and protected by DMCA provisions.